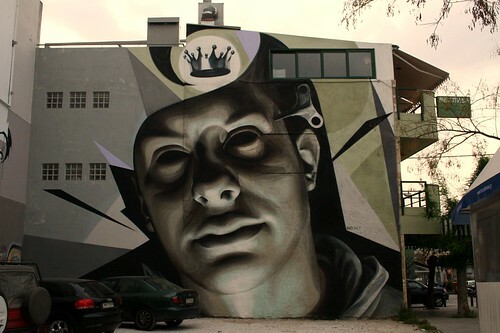 Ino from Greece livepainting in the video. I really like the work on his website entitled “Clockwork“, Athens, 2013. DYFR006, the new DYFR records after 2 years of silence. 3 timeless tracks from minimal acid / techno to cheerful electronics and ending in a massive underground acid fest. 140 gr red transparent vinyl with hand-spray-painted stencilled cover designs. The design of the version available through Bandcamp differs from the retail version in detail and composition and only about 30 will be made in this way! Quiet weapons for silent wars. Can’t take life too seriously. There are a lot of claims on the internet going around about the medicinal effects of marijuana (cannabis, weed). It is obviously a good low-level painkiller and is known to reduce the pain behind the eyes associated with glaucoma. However one of its medicinal effects that has particularly caught my eye is marijuana’s effect on cancer tumors (via Cannabinoids (CBDs)), as it seems to have the ability to aid the body in reversing tumor growth and expelling cancer from the body. Rick Simpson’s Run From the Cure talks about his hands on experience with Marijuana oil (an extract), which does not necessarily have to be psychoactive because the THC in the plant is not heated (which causes the high). And posted below is another example of a medical researcher, Dr. Christina Sanchez who has been looking into the medicinal properties of CBDs for a long time and explains her preliminary findings in this short film. Big-pharma has no reason to pursue a plant based cure because it would be impossible to patent a natural remedy, except if they work with some sort of synthetic CBD pill / extract and keep Marijuana illegal. Once the Marijuana plant becomes legal to cultivate, even if there is a patented synthetic CBD cure, the natural cure is still ‘open source’ so to speak. For them it is sadly much easier to continue to push partial ‘therapies’ that don’t work, and continue the perpetual goose chase in terms of research (and monetary grants and donations). Furthermore these very potent medicinal properties would also put the U.S. global drug policy in question, which is something that a lot of politicians, policy makers and lobbies will oppose. I will close with a totally sarcastic and out-of-context piece of a social network comment; “At least an alcoholic doesn’t go around saying beer cures cancer and can save the world.” – related to the fact that Marijuana is often smoked as a recreational drug, that it is’t only a medicine. Taillard, Michael “34 Medical Studies Proving Cannabis Cures Cancer“, Truth Theory. Web publisher, 29.07.2013. Simpson, Rick. Phoenix Tears. Website. “The Future of Weed: HIGH COUNTRY“, Motherboard online magazine by Vice. Online video. Jun. 4, 2013. Accessed 7.12.2014. At 30:02 medical marijuana is discussed. “Why I Don’t Race for The Cure – Explained by survivor Chris Wark“. Chris Wark (website), Online video. Sep 4, 2012. Accessed 15.12.2014. Tech savvy entrepreneurs take back the network during the Occupy New York movement. They had developed a software / hardware solution to wirelessly network and spread information. It seems like a very obvious next step for the makers that they develop a portable polling station to improve the accessibility of local voting on issues for instance in an area of a city. Imagine if at the general assembly demonstrators would have been allowed to vote via a server, it would be ingenious and empowering at the same time, minimizing the headache of direct-democracy and making decisions on the spot. The World Outside My Window – Time-Lapses of Earth from the ISS from David Peterson on Vimeo.